As the most efficient gateway for Canadian-destined automobiles from Asia, we receive nearly 100 per cent of all Asian-manufactured imports destined for the Canadian market and serve more than a dozen of the world’s top auto manufacturers. The Port of Vancouver’s auto terminals also handle additional cargo, such as heavy rolling machinery and equipment, and offer extensive on-dock rail and truck loading capability. 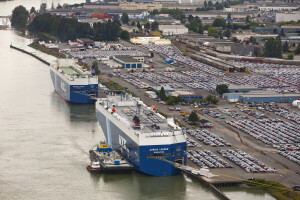 Annacis Auto Terminal Fraser River in Richmond Wallenius Wilhelmsen Logistics (WWL) Vehicle Services Canada Ltd. Handles automobile manufacturers such as General Motors Daewoo, Honda, Hyundai, Kia, Mazda, Mitsubishi, Nissan, Subaru, Suzuki and Toyota. Richmond Auto Terminal Fraser River in Richmond Wallenius Wilhelmsen Logistics (WWL) Vehicle Services Canada Ltd. Handles automobile manufacturers such as General Motors Daewoo, Honda, Hyundai, Kia, Mazda, Mitsubishi, Nissan, Subaru, Suzuki and Toyota. Richmond Auto Terminal was previously known as Fraser Wharves.